Now we improve your writing with Professional Tutor Services. Now we provide new tutoring service to our clients. This will help our students to improve their academic writing. Our tutor experts will give you feedback regarding your strengths and weaknesses of your writing. Our tutor experts are ready to guide you with professional writing in a better way. 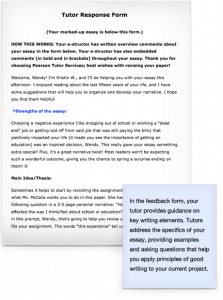 Individual assessment of your writing. Assignment and audience are the main concerns in our Professional Tutoring Service. We will send you a detailed feedback by specially including the areas like main points to be focused and a step by step assessment revision. Usually our tutors insert around 3-5 comments per each block of texts given in your write-ups. Typically we provide feedback notices within 24 hours. Our tutors provide an intensive training where you can learn the exceled practices of online writing. The tutoring service is given for HND, Bachelors, Masters and at any level of academic courses. Basically tutoring covers a wide range of services such as: narrative, academic write ups, assignments, researches, case studies and etc. Our Professional writers have Degrees of Bachelors and Masters and other academic qualifications in diverse fields. We teach the students not only to improve their current writing but also for their future writing. Addressing key areas to improve. *Please note that should you submit a longer essay, our tutors, while still providing substantial feedback, may not be able to review your entire document. Please use the “Instructions for Tutor” box to direct the tutor in case you wish the tutor to review specific pages of your submission. We can complete any task that you place an order for. Placing your order is free.